Gibbons, langurs, otters, sun bears. 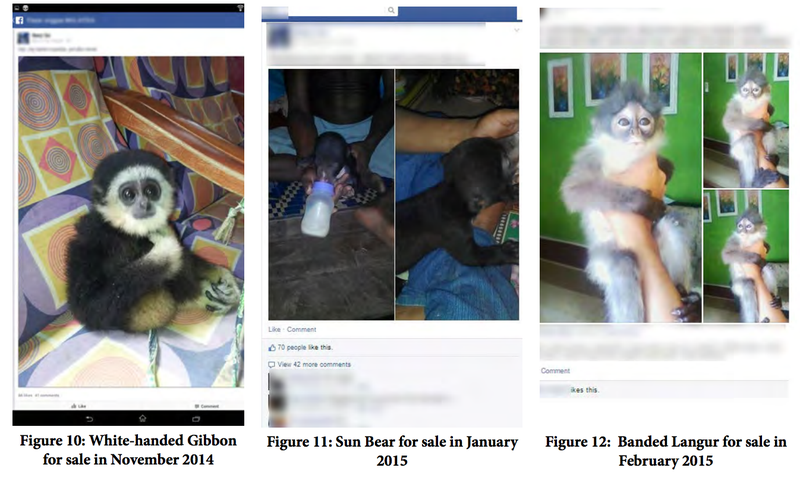 Those are just some of the hundreds of live animals listed for sale on Facebook in Malaysia. Many of them are vulnerable species, some of them critically endangered. Traffic, a global wildlife trade monitoring network, released a report today that exposes rampant illegal wildlife trade on the site. For five months, the group’s researchers monitored 14 Groups on Facebook in Malaysia, everyday, for a half hour a day. What did they find? Over 300 wild, live animals being sold as pets on the website. Nearly half the animals’ species were protected or illegal to sell under Malay law. In fact, while many of the animals found in the investigation aren’t threatened at all, others aren’t just vulnerable—they are endangered. For example, one seller offered up a white-handed gibbon, a cute creature that’s dying off rapidly. Still other animals for sale are critically endangered, including a pair of yellow-crested cockatoos and a Burmese star tortoise. According to Traffic, it’s not unexpected that this would happen in Malaysia, because the country doesn’t have legal marketplaces for exotic wildlife like much of Southeast Asia apparently does. Facebook told the BBC that it is “committed to working with Traffic to help tackle the illegal online trade of wildlife in Malaysia.” Traffic had contacted Facebook, and said that the social media site is on board with cracking down on this kind of activity. The environmentalist group also alerted Malaysian authorities—the country’s Wildlife Conservation Act 2010 protects nearly half the species found in the report from hunting or trade of any kind. Meanwhile, 25 of the 69 species that weren’t native to Malaysia are supposed to enjoy equal protection, too, under the Convention on International Trade in Endangered Species of Wild Fauna and Flora. While this particular study was restricted to Malaysia, Traffic is concerned that the problem could spread. If you’re reading this, and have ever thought about illegally purchasing a yellow-crested cockatoo on Facebook, don’t be evil. Download a lock screen image of one instead.